Ryker Miles of Biloxi, MS, runs in the 2012 Augusta IRONMAN 70.3. “Funny story, I forgot my bike shoes and had to ride 56 miles with my running shoes pressing on the little clip-on pedals. 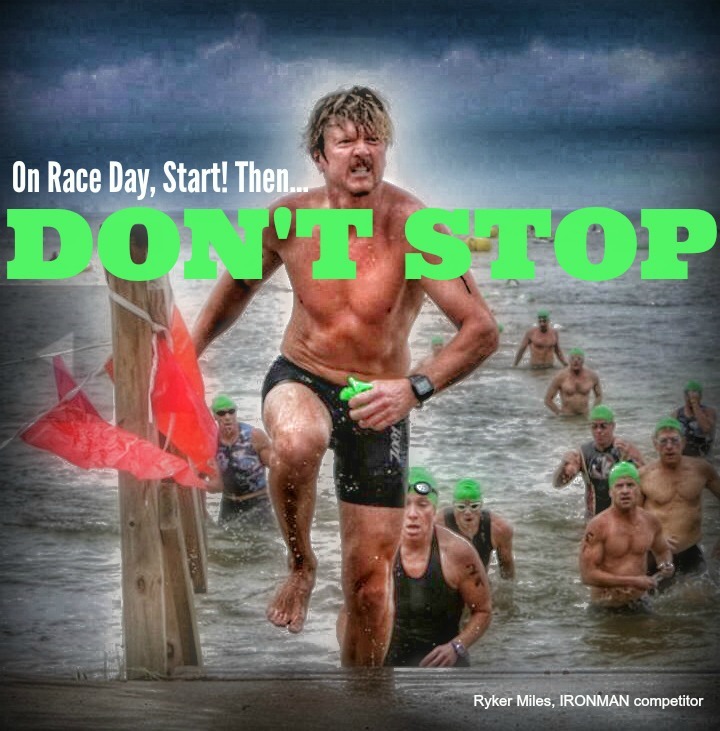 It was my best overall time in a half IRONMAN thus far,” Ryker says. I have an aversion to the coma of complacency. While this sometimes challenges those closest to me, I believe we are all either running to something or running from something, and we all have the choice of either being a spectator or a participant. We can sit up in the stands and watch the game or get on the playing field of life and really participate. I am a participant, because that’s when true evolution happens. I’m 41 years old, happily married, and have two boys, ages 6 years and 12 weeks. My family and I live in Biloxi, MS; and, when Hurricane Katrina hit the Mississippi Gulf Coast in 2005, our lives were turned upside down. But we moved forward. I began flipping houses to supplement my income as a high school history teacher and quickly learned that not having my real-estate license was costing us money. I remedied that by becoming a full-time real estate agent with Coldwell Banker Alfonso in Ocean Springs, MS.
Then, one rainy day, two guys walked in from Acme Brick Company, looking for a location to put a brickyard. I became a brick salesman soon after that. I believe in always moving forward and am blessed to have a very supportive wife and family. 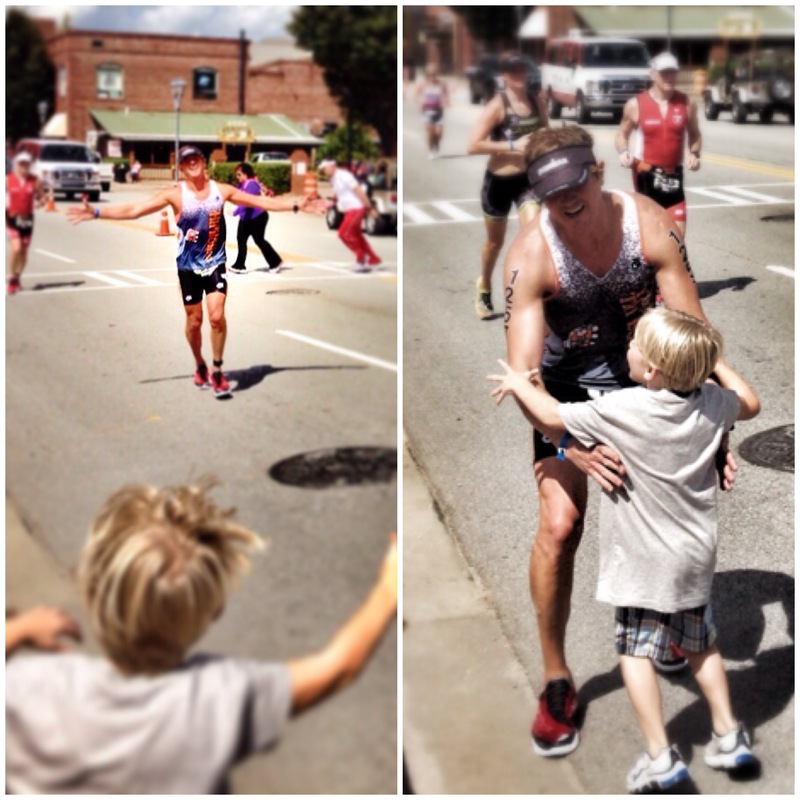 Ryker’s son, Griffin Ryker, cheers for his father during the 2013 Augusta IRONMAN 70.3. “He was so excited, and I was about to die,” says Ryker. I am currently training for IRONMAN Florida, a triathlon consisting of a 2.4-mile swim, a 112-mile bike, and a 26.2-mile marathon run. It will start with a canon blast and 3,000 people hitting the water at the same time. Everyone who completes the 140.6-mile distance in less than 17 hours will be an IRONMAN. This will be my second race on this course. I completed my first in 2012 with a time of 11 hours, 59 minutes, and 6 seconds. My goal to was to complete it in less than 12 hours. Every day involves training with some version of a swim, bike, or run and extending the duration of the rides and runs twice a week. You get to know yourself pretty well through this kind of intense training, which takes me through a series of physical and mental highs and lows. This training also provides me with opportunities to experience the beauty that nature has to offer; and I photograph these experiences so that I can share them with others. During my first full IRONMAN (Panama City, FL, 2012), my legs went into full contraction at mile 13 of the run. I was standing there, in the middle of the racecourse, looking at my legs, and thinking, what now? He was right! I was able to finish the race in the time I had set as my goal. The best part of every race is the journey. People from all walks of life participate in triathlons, from doctors to ditch diggers. Your background doesn’t matter. A triathlon is an individual sport that you do with a lot of people. You can be heavy set or thin, old or young. You don’t even have to have legs! I’ve been passed on the bike by a person biking with no legs! Prosthetics are amazing. I’ve also seen a blind man riding in tandem with a seeing partner and then pacing next to that partner during the run. I’ve seen other competitors use contraptions that would be difficult to explain. I’ve even seen a 90-year-old woman compete in a sprint race…and win in her age group! Bottom line, triathlons are more about reaching personal goals than about competing with others. My best advice for any person wanting to take part in a triathlon would be to sign up for a sprint, begin training, and on race day, start! Triathlon season runs from March to November and is filled with various race opportunities for training: sprints, Olympic-distance races, half IRONMANs, and full IRONMANs. Sprints consist of a 1/3 -1/2-mile swim, a 16-20-mile bike, and a 3-7-mile run, where you, generally, strip yourself and your bike down to the bare minimum, take one bottle of liquid nutrition for the ride, and push yourself full blast all the way! Olympic distances are much the same as sprints, except you may take an extra bottle. Half IRONMAN is a 70.3-mile race that consists of a 1.2-mile swim, a 56-mile bike, and a 13.1-mile run. Full IRONMAN is a 140.6-mile race that consists of a 2.4-mile swim, a 112-mile bike, and a 26.2-mile run. Before a race, you must be nutritionally prepared, as well as physically prepared. On the bike, you will need to consume approximately 300 calories an hour, along with staying hydrated, to not only get you through the ride but to prepare you for the run. On the run, you will see how well your nutrition planning worked. Having your legs completely lock up is not uncommon. To help prevent this, your muscles need the right balance of sodium, potassium, and hydration to keep working. During training, you’ve focused on increasing your distance, but you must also prepare for other factors and conditions that could occur on race day. When you train, be ready to perform in a myriad of conditions. Heat, cold, water conditions, water temperature, whether wet suits are legal, road conditions, and wind direction and strength are among some of the common factors to consider. This article is about my journey. There are a large number of athletes on the Mississippi Gulf Coast and around the world with amazing stories of overcoming adversity that, by far, overshadow my accomplishments. This article contains general statements of direction, and I encourage everyone to find their own way. Seek out a coaching and nutrition plan that is right for you. Some good places to start are your local library and credible sites on the Internet like www.endurancenation.us and www.run-n-tri.com. Most importantly, be safe and have fun. Ryker is currently sponsored by Zootsports.com and is a member of the Mississippi Gulf Coast Tri Club “The Ticking Tri Bombs” and the Gulf Coast Running Club. Ryker took this photo during 2013 Cruising the Coast on a morning beach run in Biloxi. Ryker took this 2012 photo in Ocean Springs, MS, of Barbara Kerby through the windshield of his car, as he was injured and could not race. Ryker took this 2014 photo of Mike Brown and Leonard Vergunst as they round the corner to head to the finish line during a race in Biloxi, MS.
Ryker took this photo of Allen Stanfield, a founder of the Ticking Tri Bombs, the largest Tri Club on the Mississippi Gulf Coast. FANTASTIC!! I was so impressed at Ryker’s spirit and great advice! Just a truly inspiring journal of determination!